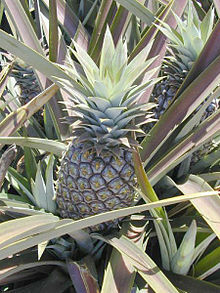 觀果鳳梨 Ananas ananassoides (Baker) L.B.Sm. 紅鳳梨 Ananas bracteatus (Lindl.) Schult. & Schult.f. 鳳梨 Ananas comosus (L.) Merr. 帕河凤梨 Ananas parguazensis Camargo & L.B.Sm. ^ Bromeliaceae. In: The Plant List (2013). Version 1.1. Published on the Internet; http://www.theplantlist.org/ [2017-8-26].